2019 Darius Rucker and Friends to Kickoff #CMAFEST at the Ryman! Presale Starts 4/9 at 10 AM CT! 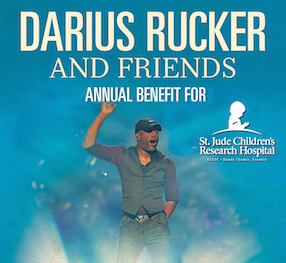 Darius Rucker will return to the Ryman Auditorium on Monday, June 3 for his 10th Annual Darius and Friends concert benefitting St. Jude Children’s Research Hospital. The event, which unofficially kicks off CMA Music Fest in downtown Nashville and has raised $1.6 million to date, will celebrate hitting the decade mark with an all-star roster of friends to be announced in the coming weeks. Tickets to the 10th Annual Darius and Friends benefit concert start at $50 with VIP options up to $150. Pre-sale access begins April 9 at 10 a.m. CT and runs through Thursday, April 11 at 10 p.m. CT, with tickets on sale to the general public this Friday, April 12 at 10 a.m. CT.